"Apperson Hall, the main engineering building for work in civil engineering, electrical engineering, and physics, was entirely remodeled during the biennium and enlarged by fifty percent through the addition of a third story. 90 x 120 feet in size, the building now comprises space on the first floor for the departments of Electrical Engineering and Light and Power; on the second floor for the departments of Electrical Engineering, Highway Engineering, and Physics; and on the third floor for the departments of Civil Engineering, Railroad Engineering, and Irrigation Engineering. The new arrangement gives much more space than the old building." 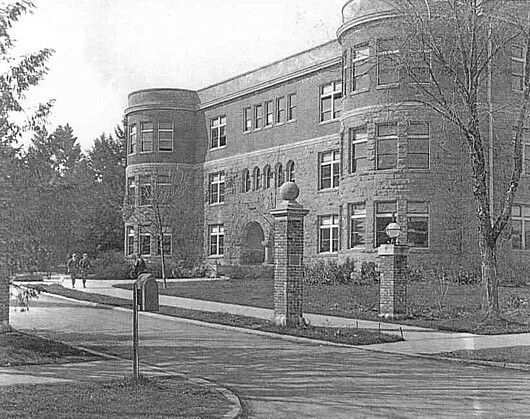 Mechanical Hall was formally changed to Apperson Hall in 1920. It was named after John Apperson, an early Oregon settler from Kentucky. He fought in the Civil War as a First Lieutenant, and after the war settled in Oregon City with his new wife Mary. He piloted steamboats for several years before taking up politics, first in Clackamas County and then in the state senate. He also became interested in Oregon Agricultural College during that time, and from 1888 to 1917 served on the Board of Regents (including two terms as president of the Board). He died on April 3, 1917; that fall, the Board of Regents accepted a portrait of John Apperson by M.M. McLouth. It now hangs in the Apperson 212, the largest classroom in Apperson. His widow, Mary Apperson, started the John Apperson Educational Fund in 1923; it continues to provide assistance to needy students. Due to approval of funds by voters in the 1920s, construction began on new buildings on campus the enlargement of four others. Apperson Hall was remodeled as well; partitions, doors and a new lab were added, the west doors were changed to swing out; and other repairs were made to "get the building into shape. "This allowed the Department of Physics and Department of Highway Engineering to move out and the Dean of Engineering to move to the second floor.